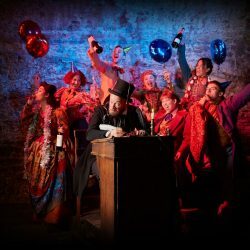 BRISTOL Old Vic brought its Year of Change to a triumphant conclusion with two five-star Christmas shows that underline the importance of imagination, courage and transformation. Under the inspired direction of Lee Lyford, all but one of the brilliant cast play multiple roles. The one is, of course, Felix Hayes as Scrooge. 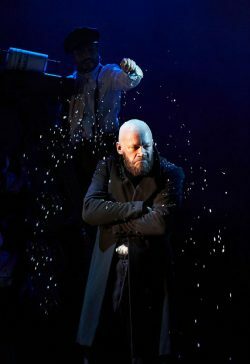 Usually played as a cartoon meanie who undergoes an almost immediate and total transformation, Tom Morris and Felix Hayes’s Eben­ezer Scrooge is one you can believe in. He has hidden his unhappiness and insecurity for so long that it surprises and frightens him when humanity threatens to emerge. It takes ALL the power of his four ghostly visitors to achieve the famous transformation – and even then Scrooge wavers. The version has also created a moment of such astonishing poignancy that the whole audience gasped. 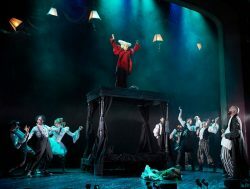 It starts with a requiem for lost souls, accompanied by atmospheric and colourful music composed by Gwyneth Herbert, who also dons a spectacular wig to play the Spirit of Christmas Present. A pantomime it isn’t, but it has audience participation and interactivity and even a volunteer child to play a starving pauper. Multi-skilled deaf actress Nadia Nadar­a­jah brings signing to the proceedings, something the rest of the ten-strong company has incorporated into the story. Tom Morris is best known (outside Bristol) for his direction of the National Theatre’s War Horse. His adaptation of A Christmas Carol is equally triumphant. Please don’t miss this breathtaking show. Posted in Reviews on 6 December, 2018 .